Colin Harvey, Winter Song. Angry Robot Books, 2009. Pp. 409. ISBN 9780007321018. $10.20 / €5.80. 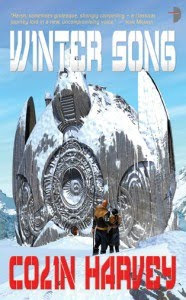 Colin Harvey's Winter Song is one of the first books to appear in the new genre imprint from HarperCollins, the promising-looking Angry Robot Books, promotional copies of which have been circulated by the BSFA and elsewhere. The story is both a hard science fiction adventure with cultural details that should please historical fiction enthusiasts, and a study of convincing and sympathetic, while complex and sometimes infuriating human characters, in all their tragic and comic aspects, their familiarity and their alienness. The world-building is proficient, detailed and explicit, as the ice planet Isheimur batters the cast of characters with an impressive array of dangers. But behind this is the more subtle Universe-building, with details hinted at and a whole never quite glimpsed, while characters are the products of their environment, and can be seen to grow and as they adapt to their settings. The narration shifts abruptly from character to character in the early stages of the book, with a close focus third-person voice for each of the three protagonists, plus a disorienting second-person narration for the most autistic and solipsistic character. With no omniscient narrator to give the book its moral compass, this is a subtle and intelligent novel full of social observation and characterization. We see from close-up the functioning of a "degenerated" society, the repression, especially of women, in a hierarchical and patriarchal culture; the women are indeed repressed by their social positions, not only by the men around them, and the men are no more free to chose their own fates (although they are, inevitably, less constrained and brutalized). Harvey's novel does a good job of undermining the romance and idealization of Viking culture, while simultaneously showing a certain admiration for the Germanic warrior's code of honour. It is to his credit that he explores these repressive, primitive, conservative and reactionary cultural features without using Muslim imagery as so many science fiction writers today seem to. Karl is the pilot and solo crew-member of a sentient spaceship that is attacked by radical Traditionals while on a long-haul journey through an apparently unsettled system. He ejects just before his ship is destroyed, and falls into the atmosphere of the winter planet Isheimur with only his healing nanophytes and micrometre-thick lifegel to protect him. Crash-landing on the icy surface of the world he is terribly injured and mentally scarred by the ordeal. Karl is rescued by Ragnar, the tyrant and respected gothi of a wealthy but desperate farmstead on the surface of this isolated planet, who saves the mysterious spaceman's life but demands a dire debt of service in return for his hospitality. The raving and schizoid off-worlder is nursed back to health by the tragic Bera, a grieving, shamed and bullied young woman who is being punished by her adoptive family for having—and losing—a child out of wedlock. The icy planet Isheimur, which orbits a binary star and is in a period of almost perpetual winter and thin atmosphere, is populated by inedible beasts, monsters named after figures from Icelandic mythology, and devolved humanoid "trolls". This freezing world—I wonder if the horror of its description would have been as intense had I not read it during one of the coldest Januaries for many years—is the setting for a story in three acts. In the first part, beautifully observed and written, we see life on the struggling farmstead under a tyrannical gothi, with a varied cast of characters and a sometimes claustrophobic atmosphere. The second part is a journey across the wilderness, a thrilling adventure, pursued by Norsemen and facing dangers every step, the protagonists learning the limits of their human (even enhanced human) abilities. The third part—in my view the weakest, with perhaps the most contrived plot-twists and morally problematic decisions—is a space journey on a doomed ship. Winter Song is a very competent book by an author with several novels to his name already. It is nicely packaged by Angry Robot Books, with an unmistakably scifi but not tasteless cover, and generally good production quality. (There are a few avoidable mistakes in the text, such as a couple of partially edited sentences, with what seem to be rewritten clauses with the original accidentally not deleted, and trivial inconsistencies such as the statement that when they first left the farm the fugitives travelled "a hundred kilometers per day" but later only half that, and a few pages later, that they had started out covering "over fifty kilometers a day" but later only half that. On the whole proofreading and editing are excellent.) That the characters, social interactions and cultures are so nicely constructed and observed is no detraction from this novel's claim to be a hard science fiction adventure, and it is the stronger book for it.